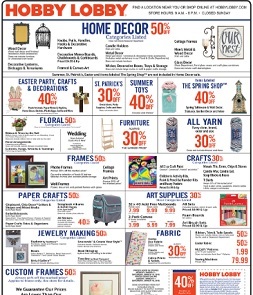 Explore this week Hobby Lobby Ad, valid April 21 – April 27, 2019: $34.99 Standing Blue Boat Shelf with Jute Accent; $9.99 Nautical Wood Wall Decor with Hooks; $9.99 Distressed White Standing Anchor Decor; $2.49 Flared Sides Votive Candle Holder; $4.79 Easter We Know Love Decor; $41.9 White Tinsel Bunny Wall Decor with Bow; $1.19 Neon Fillable Plastic Easter Eggs – Jumbo; $11.99 Pink Nested Mega Eggs; $4.79 You Had Me at Aloha Wood Block; $4.79 Pineapple of My Eye Wood Block; $11.99 Red Horse Stable Birdhouse; $5.99 Wood Birdhouse with Flower Opening; $7.79 Splash Potato Game; $1.79Multi-Color Plastic Pinwheels – Mini; $2.99 Rubber Frog Set; $8.39 Splashy Fire Hydrant Sprinkler; $4.99 Invitation Details Rubber Stamp; $1.99 Memories Rubber Stamp; $1.99 Clear Round Jewel Scatters; $3.99 Clear Glass Milk Bottle Vase with Chalkboard Label; $2.30 Bright Teal I Love this Cotton! Yarn; $3.49 Gold Yarn Bee Bejeweled Sequin Yarn; and more. Find all deals and offers in the latest Hobby Lobby Weekly Ad for your local store.